Hump day, little Friday, the 3rd day of the work week, the 4th day of the week, or Wednesday. You can call this day of the week whatever you want, but here at Carsforsale.com we call it Weird Stuff Wednesday. On Weird Stuff Wednesday we pick 3 of our favorite unique vehicles from the millions on Carsforsale.com to feature. 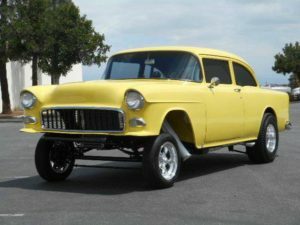 So sit back, relax, and enjoy our selections this week: A 1989 Batmobile, a completely customized Chevrolet Kodiak, and a lifted ’55 Chevrolet 150. 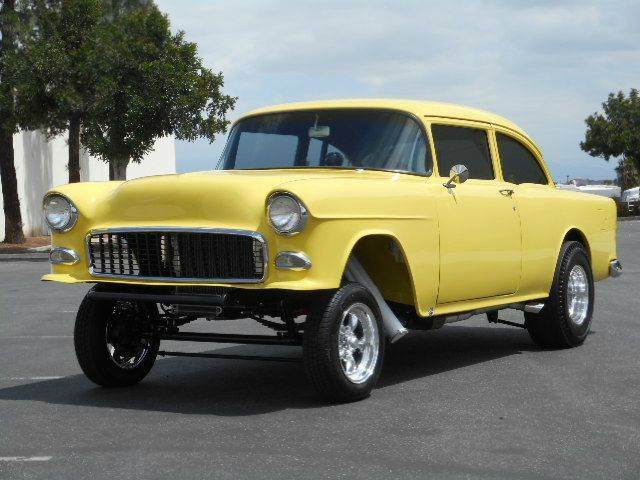 This lifted 1955 Chevrolet 150 Business Coupe is a head turner. There are less than 2000 miles on this build. The yellow exterior beautifully complements the jet black interior with Chrome accents. Technically, this ride is sound. It has a 327 V8, 10 to 1 pistons, polished Team-G intake, B&M shifter, and American Torque Thrust wheels with 30’ cheater slicks. Great attention to detail has been given to every inch of this Chevy 150. This customized 1977 Chevrolet Kodiak is completely unique. The paint scheme is a burnt orange with awesome ‘70s themed designs on the side. Do you like bears? This truck has plenty of them. There are multiple bears painted on the rear fenders, and another bear painted on the tailgate, holding true to the “Kodiak” name. Under the hood, this truck has a big block 454 Edelbrock engine. 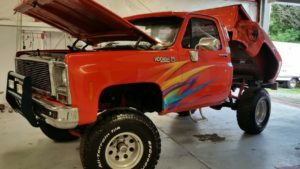 This 1977 Chevrolet Kodiak is not only lifted, but has a custom dumping back end. This ride is beautiful, unique, and powerful. 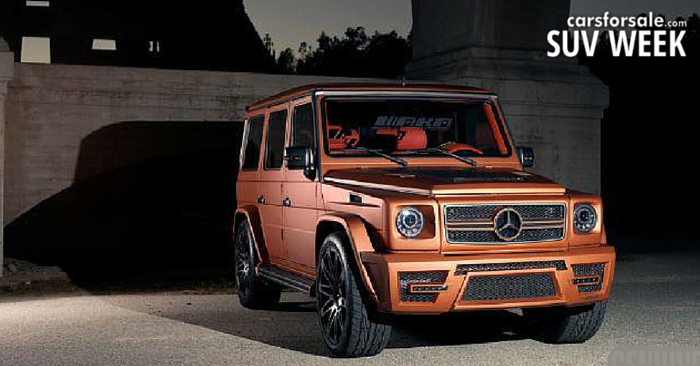 Need a vehicle that will help you protect Gotham City? Batman fans rejoice, the grand finale of this week’s Weird Stuff Wednesday is this 1989 Batmobile. 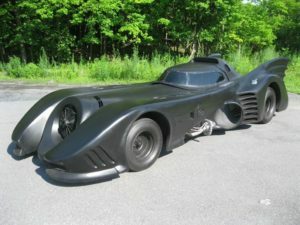 This amazing replica from the 1992 movie, Batman Returns, has a 350 Corvette engine under the hood. Buyer beware, it hasn’t been crash-tested by the IIHS or NHTSA yet. We are going to assume this isn’t street legal, but it is still decked out with the latest driving tech. Due to minimal visibility, it has a 360 degree camera in the cockpit. The racing-style seats in combination with a Batman-esque set of gauges and switches complete the ensemble perfectly. 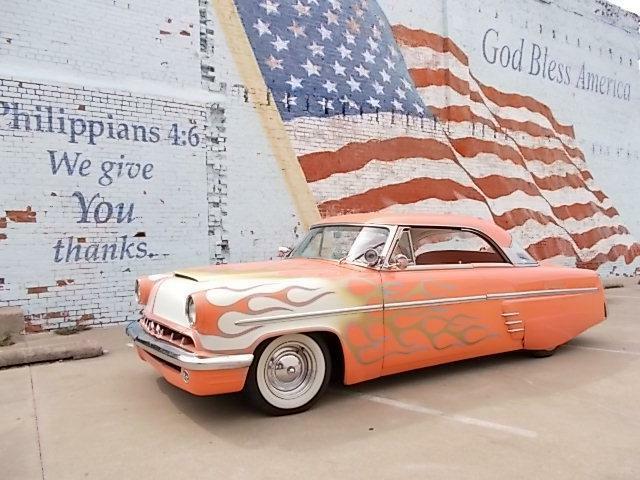 Find a vehicle on Carsforsale.com that should be featured in our next edition? Send us a link in the comments below.